Bitcoin has gone more vertical than the vertical face of Half Dome in Yosemite National Park in recent weeks, and those of us with memories of past manias and crashes know exactly what that means. Any old timers amongst you remember shrewd but mercenary upper class types tipping the family silver into the furnace to flog it off at inflated prices in 1979 – 1980 during the terminal spike in silver? Over the past few weeks we have seen Bitcoin boutiques opening in South Korea and heard stories about people mortgaging their houses to buy Bitcoin and borrowing to the hilt, and pundits “playing to the gallery” by proclaiming astronomic prices for Bitcoin in the future, although wait a minute, they’re already astronomic. The more ludicrously high their predictions the more their acolytes love them for it. The next thing you know they’ll be bringing Carlton Sheets out of retirement to do infomercials for aspiring get rich quick Millennials whose ultimate ambition is to become wealthy without doing any work so they can spend even more time fiddling with their Smartphones, and there couldn’t be any more serious warning than that. Anyway, the pattern on the Bitcoin charts has all the hallmarks of a final terminal blowoff that will be followed by a catastrophic wipeout and probably soon, and when that happens you don’t want to be anywhere near it, either that or short. 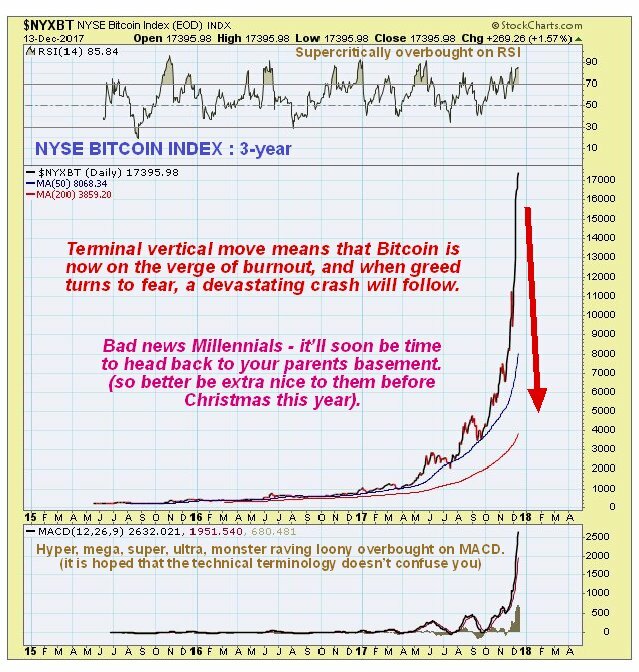 The inexperienced get rich quick merchants who have been flocking in droves to Bitcoin in recent weeks will be vaporized. Posted at 4.30 pm EST on 13th December 17.